I first tried a version of these cookies last fall when I was trying to come up with a gluten-free cookie recipe. I ended up using a gluten-free flour and adding cranberries, white chocolate and pistachios to them. They were amazing!!! Unfortunately the picture I took of them got lost and I never posted the recipe… that is until now. 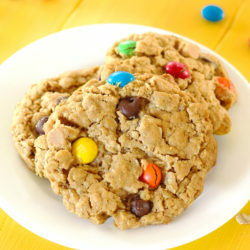 You see there’s something magical about these cookies, and it has something to do with a really unique ingredient: rice cereal. Yep. 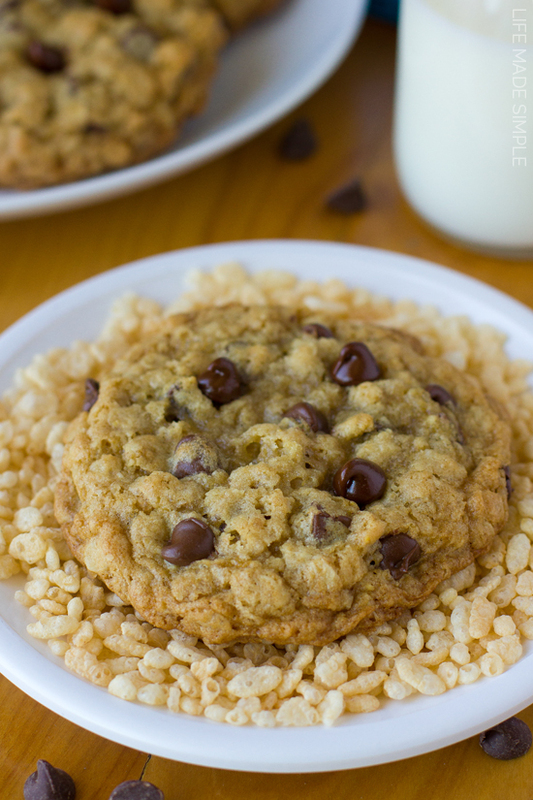 A scoop of Rice Krispies is what makes these cookies so amazing! Now before you start to think that I’ve completely lost it, just give me a chance to explain. 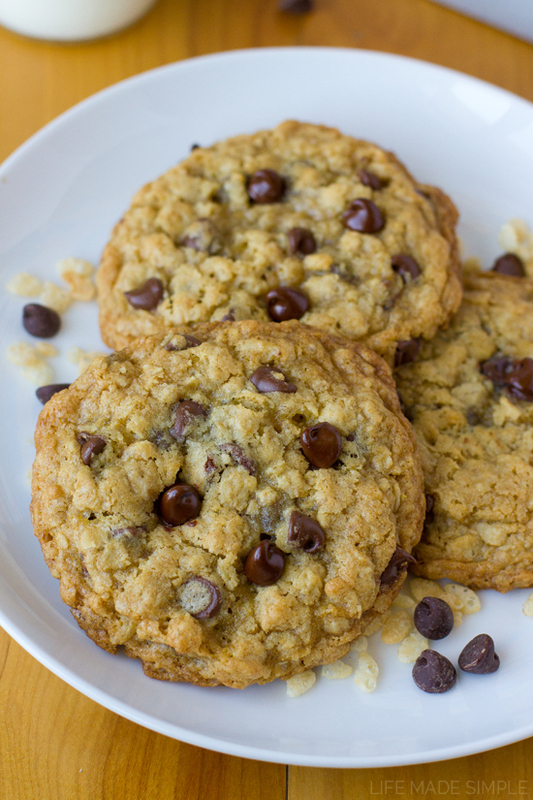 The base of these cookies is a standard oatmeal cookie recipe. I adjusted a few things so that these cookies would be nice and crispy on the edges and thick and chewy in the centers. Once I had the dough mixed up I folded in a cup of rice cereal and a cup of chocolate chips (I also made 1 batch with butterscotch chips and they were delicious too). I chilled the dough for a half hour in the refrigerator to prevent the cookies from spreading. It also helped everything meld together nicely. Once it was firm, I used my big cookie/ice cream scoop (#20) to make giant balls of dough. I placed 6 on a sheet to make sure they didn’t spread into each other and baked them for approximately 15 minutes. After allowing them to cool for a few minutes I gobbled one up. I realized that something really magical happened while they had baked. The rice cereal became almost toffee-like both in texture and flavor. I was smitten! But that wasn’t the only thing that hooked me. The edges of these cookies were extra crispy and the centers were thick and chewy with that amazing crunch. Oh, and all of the chocolate was gooey and melty too! 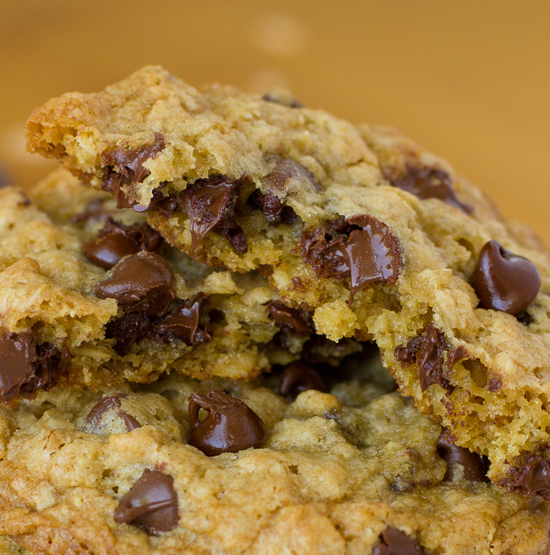 If you’re looking for unique oatmeal chocolate chip cookie, you’ve gotta give these cookies a try! 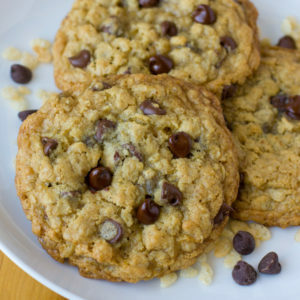 Giant oatmeal cookies loaded with rice cereal and chocolate chips. 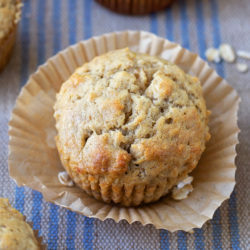 These crispy crunchy oatmeal cookies are hard to resist! Preheat oven to 350 degrees. Line baking sheets with parchment paper or baking mats. In the bowl of a stand mixer, cream the butter, sugars and vanilla until light and fluffy, about 2-3 minutes. Add the egg and mix until incorporated. In a separate mixing bowl, whisk together the flour, baking powder, baking powder, cornstarch, salt and oats. With the mixing speed on low, gradually incorporate the dry ingredients. Remove the bowl and fold in the rice cereal and chocolate chips with a spatula. Cover and place dough in the refrigerator for 30 minutes. Using a large cookie scoop (I like my #20) or a ¼ c. measuring cup, form large balls of dough and place 6 on a sheet at a time. Bake for 14-16 minutes or until lightly golden brown on the tops and crispy on the edges. Allow the cookies to cool on the baking sheets for 5 minutes before transferring them to a wire rack to cool completely. 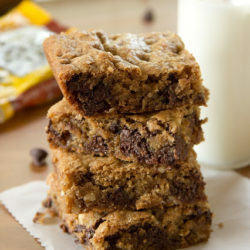 -These cookies are fantastic with chocolate chips or butterscotch chips. I've also made them with toffee in them and I've made a cranberry white chocolate version as well. Just made these! I like the crunch from the puffed rice and it does become almost toffee-like. Eating the cookie dough is is super fun! I chilled the first batch of these for 30 minutes and they spread more than I’d like; I kept the bowl in the fridge and chilled later batches for longer, which turned out great. Hi, What awesome cookies…They didn’t last long at our house. Someone actually took the bag and hid them so no one else would get any. Haha, that’s awesome! So happy to hear that your family loved them as much as mine.